The Janus project team has been dropping hints and updates in their Slack channel, as well as announced some significant changes for the Janus project, which are going to be implemented. Here's a summary, to Janus holders but also to those who still hold back from investing in Janus. 22,500,000,000 Janus tokens were issued on 5-Aug-2016, 06:31 pm. There was an ICO. Then there was an NXT token sale. And community building. 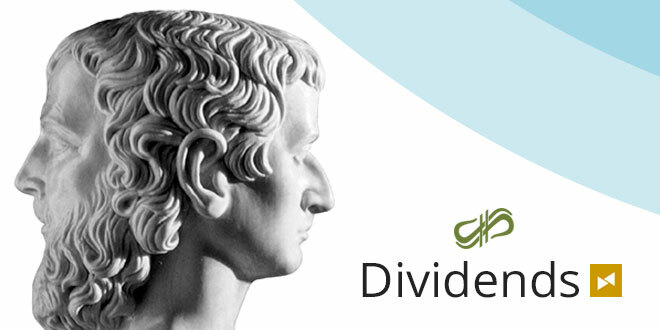 5 Million of that will be kept on the main Janus account (they receive none of the dividends, therefore do not detract). 2.5 million for our team's holdings, 2.5 million for community efforts/bounties in the future and the like, 2 million will go to the final JanusXT holder when he/she comes to us. When the 2nd distribution of Janus tokens on c-cex.com and on the Nxt AE have been sold out, NO MORE tokens will be sold by the Janus Team. July 3rd is the end date of the 2nd distribution, plus the last chance to support the Janus team directly. Remember that any buy from the team is an investment in the team's work, which aims to make your investment worth. After July 3rd the market will be fighting each other for tokens. We decided this is best to carry all who are in since December until this July with us. Then after latecomers will have to pay more premium. By premium I mean they gonna be buying it from you all. However sells could get ever scarce as the passive income becomes the level we want, and I plan to add Janus as a payment option to 2 sites for a continuous buy up driver. The key is making a discount enough to take the time to buy and use it as payment. If a service on social trading site is 400 USD for example a 25% discount paid via Janus tokens should motivate. This then feeds us tokens, causes market push, and should in theory drive volume. A new game will be added to BetterBets.io this month. 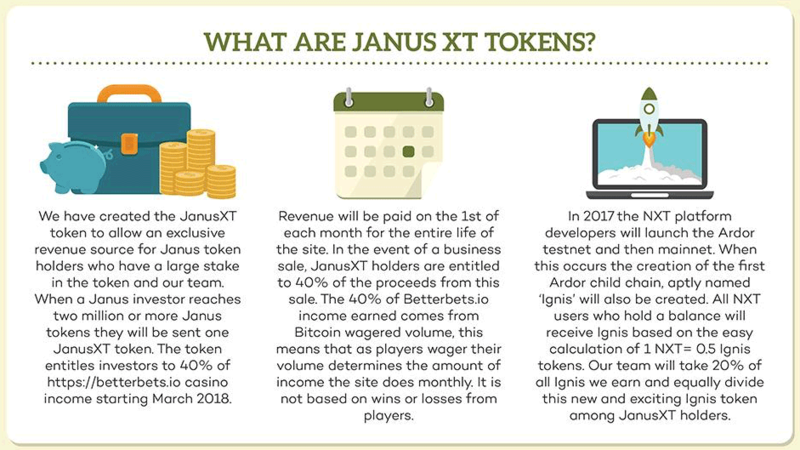 Janus holders can expect an addition to the monthly NXT profit share from the BetterBets.io Casino, “people who aren’t a fan of dice may really like this one,” bjorn_bb writes. Janus holders will get 90% of the NXT profit. This is an unexpected evolvement, and the new site's going to add an extra revenue stream to Janus and JanusXT holders. 10% to Janus holders, 10% to JanusXT holders, 10% to the "outside developers" for helping push the site + also helping Janus, and 70% to the Janus Team. This site will easily be replicated to many areas of pop culture. And yup, it's just one of the advantages of being an XT holder. A new and influential member has joined the Janus team. Who this person is, will be announced soon. His work will begin with the launch of the social trading site. His job won't be like ours, he may work 20 hours a month but what he can provide is priceless. I am proud of what I can do, but he can open doors that are impossible for even top marketers. It's hard for a new guy to come into a team working together for so long, but he's everything I realized when we met last summer. I just didn't think he would be interested in joining until January. 30+ years of experience in numerous fields and industry very few have direct access to. We are coordinating with the Nxt Foundation to get his identity verified for you (I assume you all trust their word by now). Once that's done we can roll out the QA with him on a yet to be determined medium, end of the month. His passport has been sent to the Nxt Foundation who will talk with him and confirm his identity. When the QA comes there will be no doubts about his authenticity and we will see why this verification process was important. "So that we aren't making some crazy claims", writes Bjorn. Janus' aims to hit the mainstream with this site, which will soon be beta-released and tested inside the community, then soft-launched in July. Trademimic.com is focused on Forex, but as we said in December, it will have altcoin options and Bitcoin. Subscription based. And there will be tiered packages. More options higher price. We'll finish up with the social trading fintech site by July. Then market like mad. Our new team member's first major assignment will be that site. Do not miss a Janus update, join their Slack channel, and follow their social media channels. More Nxt assets can be explored on nxter.org/assethub.